Republican Sen. Pete Domenici of New Mexico, one of the most influential voices in Congress on budget and energy issues, announced Thursday that he is retiring at the end of his sixth term because of a degenerative brain disease. "I come here today, to the site of the school that I attended as a boy, to tell you that I will not run for re-election to the United States Senate," Domenici said at a news conference in the Albuquerque neighborhood where he grew up. After a medical exam last month revealed progression of an incurable brain disorder known as frontotemporal lobar degeneration, or FLTD, the 75-year-old senator discussed retirement with his family and concluded that he might not physically be able to serve a full seventh term. "The progress of this disease is apparently erratic and unpredictable. It may well be that seven years from now, it will be stable," Domenici said. "On the other hand, it may also be that the disease will have incapacitated me. That's possible." "I am not willing to take a chance that the people who have so honored me with their trust for 40 years might not be served as well as they deserve in the United States Senate." The disease is a type of dementia, and its name refers to the slow deterioration of affected sections of the brain, the front and lower sides - areas that control such things as language and behavior. Symptoms include increasing difficulty with speech and Parkinson's disease-like movement problems. "No cure for my disease exists yet," Domenici said. "But if we work hard enough we may be able to cure people with diseases of the brain." 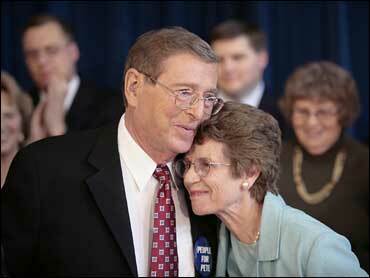 Domenici told a crowd of about 100 family members, friends and supporters that he was confident that he will be able to serve out his current term, which expires in January 2009. During his speech, he smiled broadly and joked, calling people in the audience by name and recalling projects that they had worked on together. Until this week, Domenici had appeared committed to a re-election bid, having President Bush attend a fundraiser in late August that collected more than $400,000 for the senator. But Democrats had begun to view Domenici as politically vulnerable because of his support for the war in Iraq and ethical questions raised by his telephone call to New Mexico's federal prosecutor before last year's general election. David Iglesias, a Republican who was fired as U.S. attorney, has testified in Congress that he felt pressured by Domenici and Rep. Healther Wilson, R-N.M., to rush indictments in a corruption case involving Democrats. The Associated Press reports that Wilson intends to seek the Senate seat being vacated by Domenici. Wilson made the decision Thursday after meeting with her family and notified her staff Friday morning. She was calling supporters around New Mexico to tell them of her decision, according to a senior adviser to Wilson who spoke on condition of anonymity so as not to pre-empt a formal announcement expected later Friday. Domenici has acknowledged calling Iglesias, but says he didn't pressure the prosecutor and was following up on constituent complaints about the slow pace of an investigation into fraud and kickbacks in a courthouse construction project. With Domenici's retirement, Republicans must defend 22 of 34 seats on the 2008 ballot. No Democrats have announced retirement plans. Senate Republicans lost their majority in 2006. Democrats control the Senate with 49 seats plus the backing of two independents. Republicans hold the other 49 seats. Domenici's decision is a serious blow to Senate Republicans, reports CBS News correspondent Chip Reid. With four other senior Republicans already saying they plan to leave, the chances of them retaking the Senate are now even slimmer. Domenici's retirement scrambles the 2008 elections in New Mexico. Top Republicans and Democrats are considering whether to jump into what will be the first open Senate race in the state since 1972. "Obviously, it makes '08 much more exciting in New Mexico than it was, and it was already looking like it would be pretty exciting," said Lonna Atkeson, a University of New Mexico political science professor. On Capitol Hill, Domenici was known as a deficit hawk for his budget-balancing work in the 1980s and '90s as chairman or the senior GOP member of the Senate Budget Committee. He also watched closely over New Mexico's interests and used a seat on the powerful Appropriations Committee to steer money to federal installations in the state such as Los Alamos and Sandia national laboratories. Mr. Bush, in a statement Thursday, praised Domenici as "a skilled and determined legislator", citing his work on national energy policy, lowering taxes, balancing the budget and reducing government spending. After 35 years in the senate many in New Mexico call Domenici "Saint Pete" for the countless federal projects he has showered on the state, reports Reid. Domenici once said that his service on the Budget Committee was a highlight of his career. He helped assemble an agreement with President Clinton in 1997 for balancing the federal budget. But he gave up the Budget Committee and moved to the Energy Committee after the 2002 elections to become its chairman. An energy measure signed by Mr. Bush in 2005 provided tax breaks for energy companies and renewable energy development. It didn't include a proposal for oil drilling in an Arctic wildlife refuge, which Domenici had supported along with Mr. Bush. Among the potential contenders for Domenici's Senate seat are Republican Reps. Wilson and Steve Pearce and Democratic Rep. Tom Udall. Lt. Gov. Diane Denish, Albuquerque Mayor Martin Chavez and former Attorney General Patricia Madrid are other Democrats eyeing the race. Democratic Gov. Bill Richardson said Thursday that he remains focused on his presidential bid.